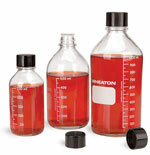 For more information on Wide Mouth Clear Glass Reagent Bottles w/ Ground Glass Stoppers.. These clear glass wide mouth reagent bottles with ground glass stoppers feature a no-drip pour lip for easy pouring of contents. 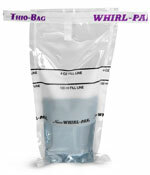 The bottles are ideal for solids and viscous liquids. These bottles feature a unique design that makes them easy to clean with a lab brush or in a glassware washer. The ground stoppers are octagon-shaped and interchangeable. The bottle's specially designed rim will not allow fluids to run down the outside of the bottle. 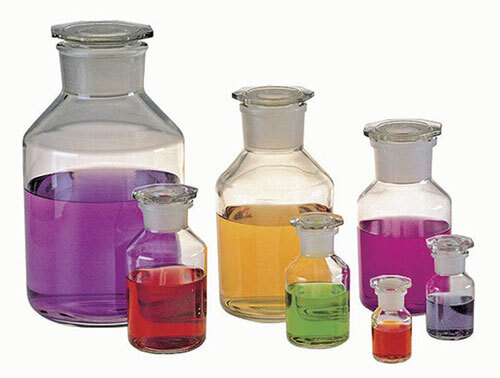 The bottles are made from borosilicate glass.